download Zotero's cite while you write word processing add-ons. The examples provided use Firefox, but downloading Zotero for Chrome or Safari is very similar. Either watch the video or view the step-by-step screenshots. For a text-based version of the directions, view the video transcript. Note: It may be best to watch this screencast in the Internet Explorer browser (or other browser) to keep your Firefox browser from closing and re-starting the screencast if you are following along with the directions. 1. Zotero works with the browsers Firefox, Chrome and Safari. I will demonstrate installing Zotero Standalone for Chrome on a PC. (For directions on how to install Zotero for other browsers, check out these directions.) There are two download parts: installing the Zotero library (steps 2-6) and installing the Zotero browser extension (steps 7-8). 2. Go to http://www.zotero.org/ to download Zotero. Click the "download" button. 3. On the following page, first download the Zotero library assistant. Select the blue download button. 4. In Chrome, an .exe file will appear in the lower left corner of your browser. Double click the file name to open it. Depending on your browser the location of downloaded files may be slightly different. If you have trouble finding the file, search your computer for "Zotero." 5. 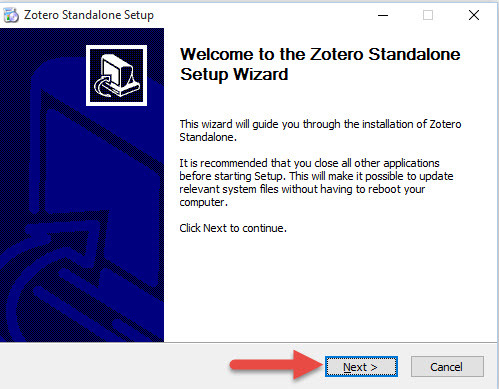 Next, the Zotero Setup Wizard will open. Walk through the four steps of the Wizard. Choose "standard" installation, then "install." On the last screen of the Wizard, click "finish." 6. Your Zotero library will open. 7. Next, download the browser extension, also at the Zotero download website. Make sure to install the version that matches your browser, for example, Chrome. The browser extension allows you to automatically download citation information from journal websites or search tools like Google Scholar. 8. 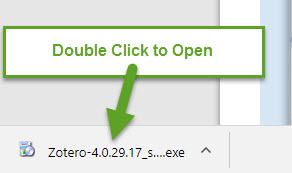 When prompted to add the "Zotero Connector," click add extension. That's it! You have successfully installed your Zotero library and are now ready to add sources to your library.